The SLOW-GO Speed Control System is extremely simple to install, bolting directly to the existing road surface avoiding any costly excavation or civil works. 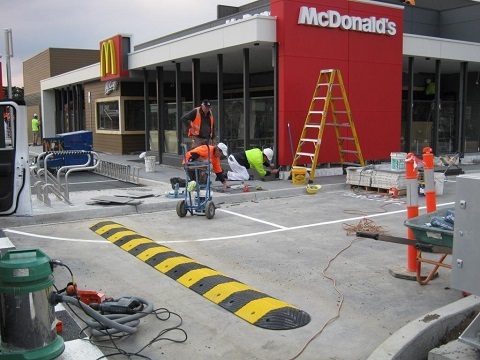 Our fully trained and experiences installation teams offer an unsurpassed level of service, with installation of an average 6 meter speed hump in around 25 minutes minimizing traffic flow disruption. For your convenience Polite Enterprises can co-ordinate on site installation 7 days a week, 24 hours a day if necessary. These time lapse photos show the ease and speed with which the SLOW-GO Speed Control System is installed.